Good Gravy! This recipe for Five Minute Gluten-Free Gravy is a GAME-CHANGER. Everybody needs a good gluten-free gravy recipe, right? The easier it is, the better and this one is so easy it’s ready in no time. I posted this gluten-free gravy about 4 years ago and decided recently that it was time for some updated photos – so you can really see how easy and delicious this gluten-free gravy is. This is our go-to recipe for all things gravy. 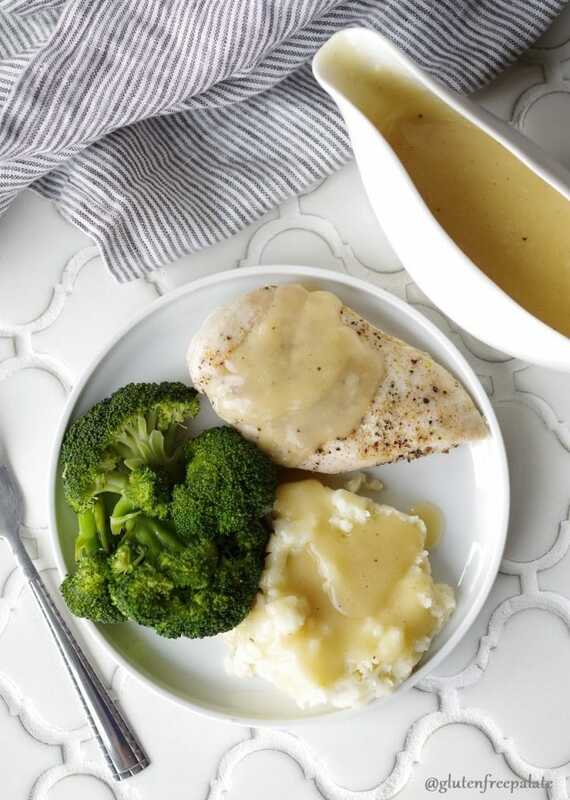 This gluten-free gravy recipe only requires a few ingredients, including broth (or cooled turkey drippings) – and you can switch up the type of broth you use in this Five Minute Gluten-Free Gravy to make it work for the meal you are serving. Also, this recipe is fail proof (as long as you keep stirring while it cooks and thickens). 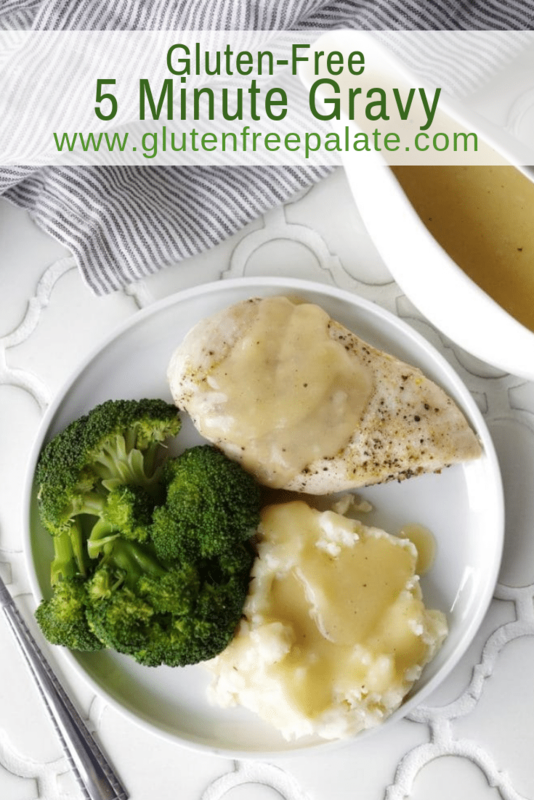 This easy gluten-free gravy recipe is smooth and savory and a huge hit in my house of picky eaters – so I had to share it with you. I don’t normally whip up a pot of gluten-free gravy in the summer but this recipe is simple enough that I’ll make it any time of year when we want mashed potatoes and gravy. And my oldest daughter and I love gravy so much, that we make it anytime my husband makes mashed potatoes. It’s not overpowering, and it adds just enough extra texture and flavor, that it works well on Parmesan and Dill Roasted Red Potatoes and meats as well. Can I use a flour blend that contains xanthan gum in gluten-free gravy? Yes. While I don’t usually create recipes that need xanthan gum I’ve used Bob’s Red Mill 1-to-1 gluten-free flour in this recipe and it has xanthan gum. The trick with it having the xanthan gum is that you have to add it to cold ingredients, or it will clump up in the gravy – the same with starches. Make sure to add your flours or starches to cold liquid. They should rise in temperature together while you are whisking it over the stove. 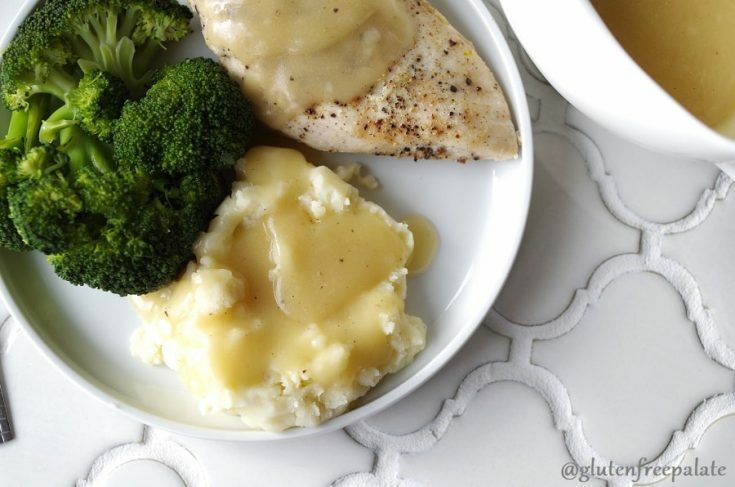 Can you substitute something else for the butter in this gluten-free gravy? Yes! You can use dairy-free butter in this recipe. I’ve used Smart Balance and Earth Balance and both worked well. Just note that leftover gluten-free gravy will separate a little in the refrigerator. Stir it back together after you reheat leftover gravy. There are a couple of quick tips that YOU MUST READ. They will really help you make the perfect fail-proof gravy. Put all the ingredients in the pot THEN heat. If you don’t your flour will clump. No body likes clumpy gravy. You can use regular butter, or dairy-free butter. All broth options work (chicken, turkey, veggie, beef). If you use turkey drippings, let it come to room temperature first. Also, test to see how strong the flavor is, you might want to add water. If you don’t have broth or turkey drippings, you can use bullion cubes to make broth. Again, follow these simple instructions and you will have the perfect gravy. Like I mentioned above, with any gluten-free gravy you are going to want to start with cold or room temperature ingredients. Heating and stirring the ingredients together is what makes the gravy thick and smooth. If you add the flour after, or add the gluten-free flour straight to the hot turkey drippings it will clump. I forgot to add the flour before I cooked the other ingredients, what do I do? If you forgot to add the gluten-free flour before cooking, mix the flour in a bowl with a 1/4 cup of cold broth or cooled turkey drippings, then add it to the hot ingredients. Keep boiling the gravy, and stirring until you reach the desired thickness. 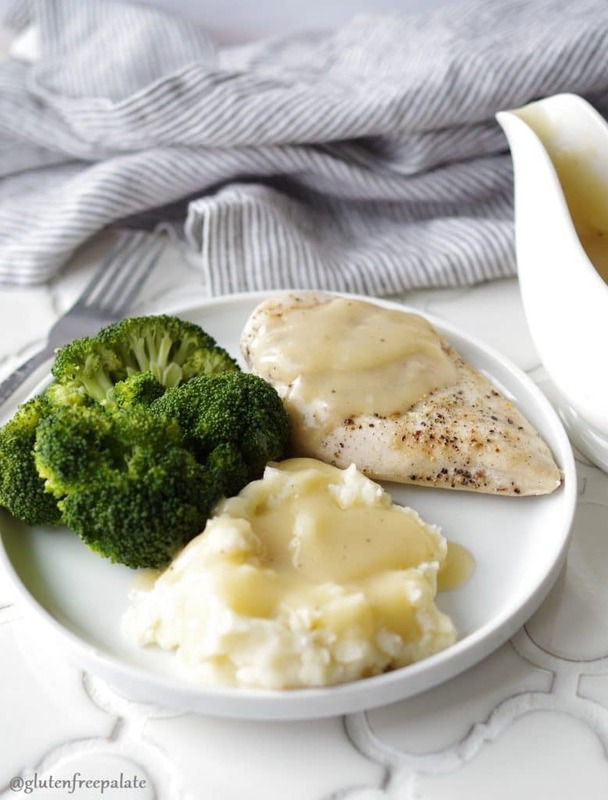 If you want to make your gravy thicker, mix 2 tablespoons gluten-free flour in a bowl with 2-3 tablespoons of of cold broth or cooled turkey drippings, then add it to the hot ingredients. Keep boiling the gravy, and stirring until you reach the desired thickness. That’s it. You can go make gravy now. After you make it, come back and tell me what kind of broth you used, and what you thought. If you followed the recipe exactly, and read the tips above, you should’ve made the best gravy EVER. Well, maybe not the best ever, but this should be one of your favorites. I used to be the only one in the family who liked gravy and this recipe converted my kids to gravy-lovers. Even if you’re the only one who likes gravy, this is a small batch recipe (that can be doubled) so don’t worry about having too much, or too little. I usually make gravy with the leftover broth (a.k.a drippings) from cooking poultry and when I developed this recipe we didn’t have any so I had to compromise. Broth it was! Easy right? You can add extra spices (like pepper, onion powder, etc.) if you like. But really, it’s perfect as is. Simply place the ingredients in the pan cold or at room temperature, whisk, and serve! Looking for more sides? Try my Lemon Wok Asparagus and my Parmesan and Dill Roasted Red Potatoes. 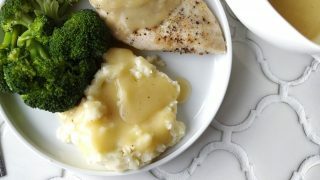 If you are looking for a great mashed potato recipe to serve this gluten-free gravy recipe with you might like Michelle’s Instant Pot Mashed Potatoes. Her Gluten-Free Pull-Apart Dinner Rolls are recommended too! If you make this gravy, please stop back by and leave a comment letting me know what you think. I love it when people leave comments letting me know they made this gravy, and loved it. It lets me know I’m on the right track with my recipe development. This recipe for Five Minute Gluten-Free Gravy is a GAME-CHANGER. Everybody needs a good gluten-free gravy recipe, right? The easier it is, the better and this one is so easy it’s ready in no time. Place all your ingredients in a small sauce pan and heat over medium heat. Whisk constantly. When your gravy starts to boil, whisk until all the ingredients are combined and your gravy is smooth. Remove from the heat and cool to desired temperature before serving. Store leftovers in an airtight container in the refrigerator for up to a week or a freezer for up to three months. Sounds easy and tasty! I’m always up for gravy. 😉 Thanks for sharing this at Savoring Saturdays, Chrystal! Hope to see you back this weekend! Beautiful gravy, Chrystal! Folks are going to love this recipe for everyday and the holidays as well, of course. 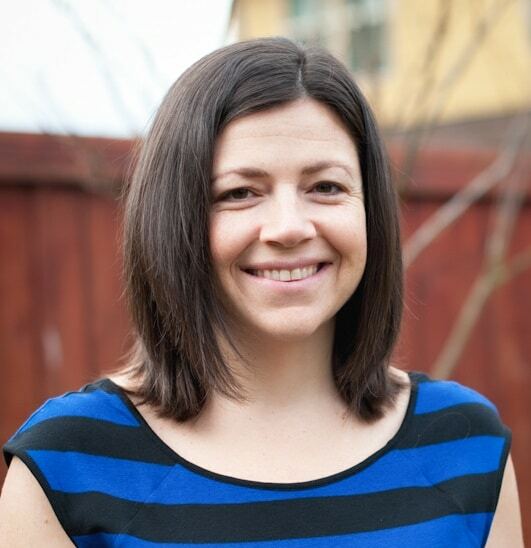 🙂 I so appreciate you sharing it on our Gluten-Free Recipe Fix Back-to-School and Fall Recipes edition! Do you recommend a flour that does not contain xanthum gum? Or does it matter? I tried making gravy with a store brand all purpose gluten free four blend (with xanthum gum) and it was a clumpy disaster….but it might be that I added it to hot drippings. Thanks for that tip! I’ve used Bob’s Red Mill in this and it has xanthan gum in it. The trick with it having the xanthan gum is that you have to add it to cold ingredients, or it will clump like you experiences. The other thing you can do is sift it slowly into your hot drippings, while stirring it. I love a recipe that’s not only tasty but can come together in just 5 minutes. Looks Fab! Looks great, can you substitute something else for the butter? Yes! You can use dairy-free butter in this recipe. I’ve used Smart Balance and Earth Balance and both worked well. What perfect timing with Thanksgiving around the corner! 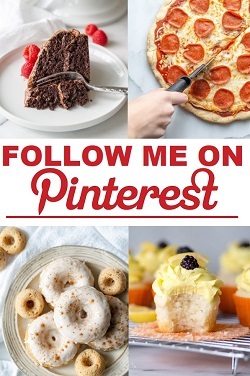 I also pinned it to my Christmas dinner board! You had me at 5 minutes. And I love that you use such a simple flour blend that doesn’t use brown rice flour! Easy peasy. 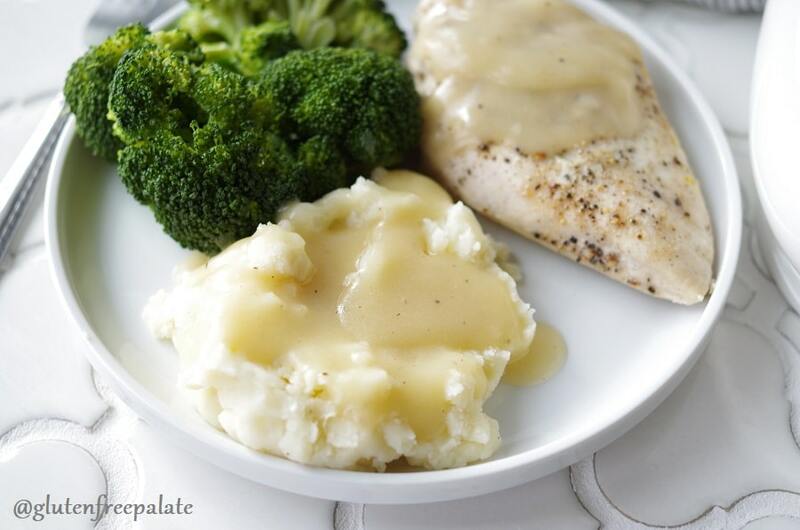 I’m a sucker for gravy….just gotta have it with my mashed potatoes. When I lived in Canada, we did gravy on our french fries and this one looks like it’d be perfect for that too. This is so quick! This is a recipe I know I will use a lot for meat, potatoes….cottage pie…YUM! I haven’t tried ghee in this recipe. If you do try it, start with half the amount. Coconut flour wont work in this recipe. You could use trapico, or corn starch, but you’ll want to start with 2 tablespoons and work from there. Put the starch in a little water and dissolve before you add it to the pan. I’m wondering if the butter and flour could be combined to ake a rue. That way the hot drippings could be afded to that? Ordo you still think it would get lumpy? You could add a little water to the flour and mix before adding it to the drippings. I hope that helps. Thanks for this! Can I use almond flour for this gravy recipe? Almond flour wont work in this recipe. If you want to keep it grain free, you can use arrowroot powder. Start with 2 tablespoons, and then add up to 1 more tablespoon if you want it thicker. I liked this recipe because it’s very versatile as a base for many variations. I just made it using green banana flour and schmaltz for the fat. You don’t taste any banana and it gives it a brown gravy color. I used stock from cooking meatballs. I added some fried mushrooms and black pepper. Gluten free, grain free, paleo, and dairy free. Thank you Chrystal. This is so easy and delicious! This will be my go-to gravy recipe. I used Now brand All purpose GF flour. I added a little thyme powder too. Chrystal..can I make this gravy the day before serving it and keep it in the frig? thanks! Yes. Just a heads up that depending on the flour blend you use, it may separate in the fridge. Just reheat and whisk. How many servings does this recipe make? I may have missed where you stated that but need to know if I should double it for 15 people plus leftovers. Thank you! Happy Thanksgivings! This serving makes about 2.5 cups of gravy. I usually factor about 1/4 cup per person, and guess that this feeds 8-10 with no leftovers. When we do our family of 20, I make a double batch. I hope that helps. Do you have a recipe for the white country gravy with sausage? I miss biscuits and sausage gravy! Seriously the easiest and best gravy ever! 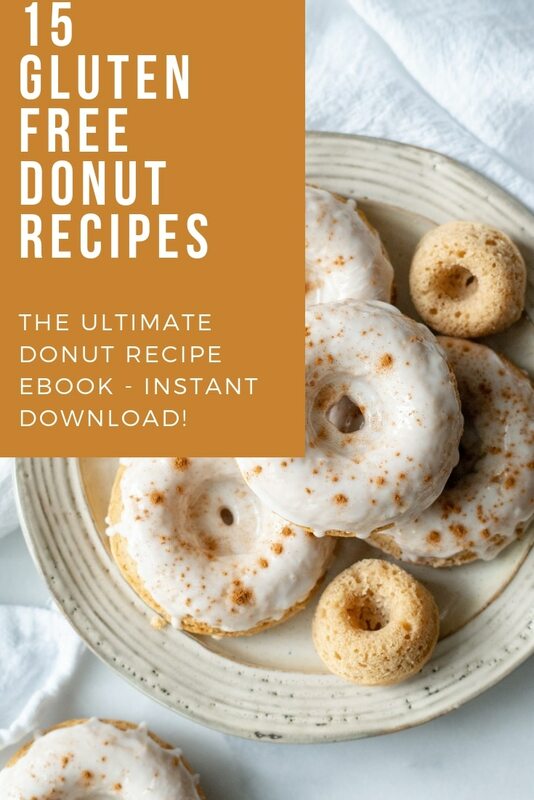 Love that it is gluten-free 🙂 Thank you for having this recipe here! I doubled it, put some of the box broth in a small jar with a lid and added the Bob’s Red Mill 1 to 1 flour, gave it a good shake and slowly poured it into my pan with the rest of the broth and the butter that were warming, stirring the whole time. Came together beautifully!! Added 1/2 tsp curry powder, shredded green apple and left over turkey – my hubby was thrilled!! I’m so glad you liked it. Thank you for stopping by and letting me know. Great gravy recipe…thank you so much! I’m so glad you like it 🙂 Thank you for stopping by to let me know. Great recipe. Has worked perfectly every time. I use your flour blend. I am going to try it tonight adding sauteed mushrooms and using some homemade mushroom broth I had in the freezer. Thanks! So glad you like this gravy Karen! I’ve added sauteed onions before. I’ll have to try mushrooms sometime. My wife is on a low-FODMAP program, and I’ve always made a “light cream” gravy, using milk instead of meat drippings. So, I used gluten-free flour with lactose-free milk and ended up with a fantastic gravy. Thanks for the suggestion to cook all the ingredients together instead of the usual roux, because it worked like a charm. I am so glad you like this gravy recipe. Thank you for sharing what you used.